Is Your Recruiting Process Stuck in the 80’s? 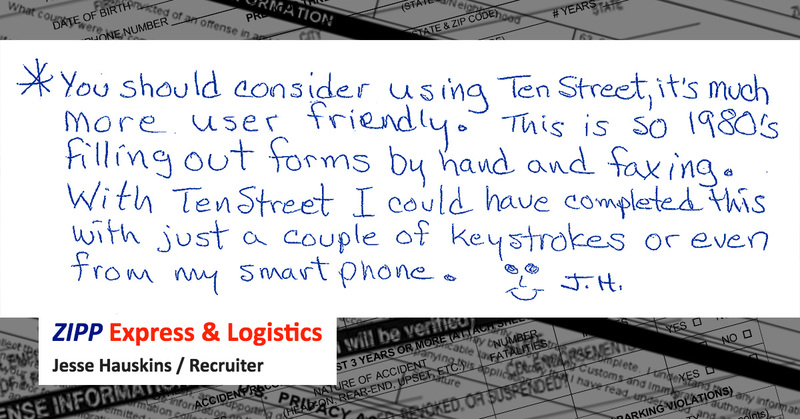 Tenstreet gives you a competitive advantage by increasing application volume and recruiter production through our Processing Software. Our Xpress and Xchange products now allow candidates and recruiters to have access to prior applications, forms, and verifications. This makes the distribution and application process more detailed and much more efficient. Processing is no longer a tedious task. We offer background check integration, instant PSP checks, recruiting and processing workflow, potential missing employee alerts, and FCRA compliance through our Adverse Action letter process. With our Xpress and Xchange software and key features, you no longer need to spend hours over a fax machine. Our processing systems will ensure document accuracy, increased application volume, and accelerate recruiter production. What's Free and Better than 11,000+ Trucking Carrier Fax Numbers? Xpress dynamic workflow management allows you to bring efficiency to the hiring process and the ability to measure speed to hire.